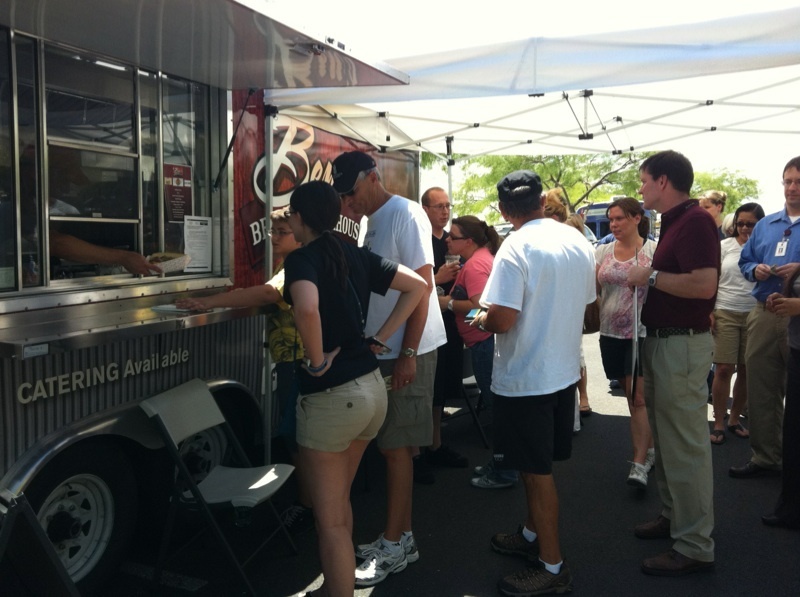 During my parents visit to Vegas there was a food truck event going on at the Nevada Cancer Institute called the Food Truck Roundup. 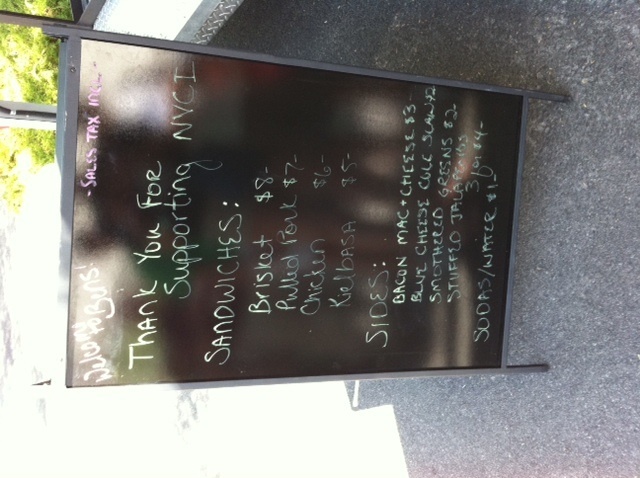 Four food trucks were there and a percentage of their sales went to the NVCI. The event is put on by own of my favorite Food Trucks, Ben’s BBQ. I haven’t had a chance to feature them yet, since my work schedule over the summer never matched up with their schedule. Luckily I was able to bring my parents to try out my fav BBQ in Vegas! 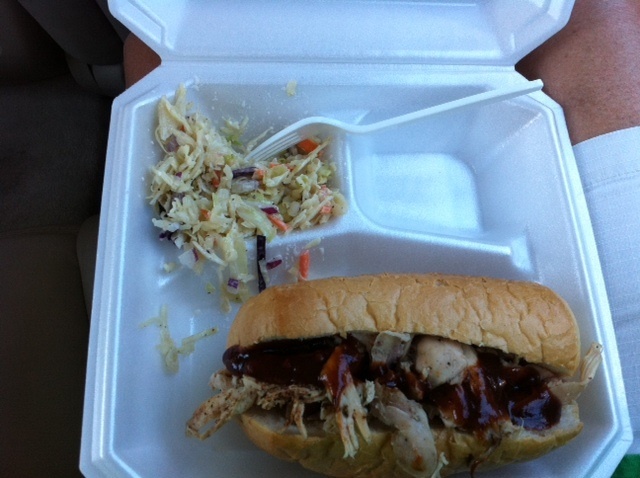 Ben’s BBQ is newer to the food truck world in Vegas but they make amazing bbq! Since living in the south I really love bbq and hadn’t found any I was totally in love with until I tried Ben’s for the first time. But I won’t just tell you how good it is, I’ll show you! My Dad and I ordering, they had a nice crowd, which I always love seeing! 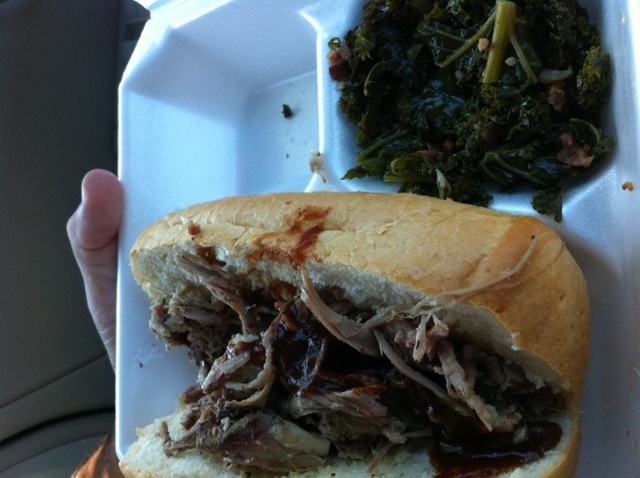 My dad got the pulled pork sandwich (so did I) and the smothered greens. My dad grew up eating greens so he knows his stuff and he really really liked these! We both really enjoyed their pulled pork sandwiches. The meat was really good and the hoagie roll was soft and perfect for the sandwich. They offer two BBQ sauces, we tried their milder one (hot doesn’t really go well for my family) and it was perfect! My mom got the BBQ chicken sandwich (my mom is the healthy one in the family, she’s doing a sprint triathlon tomorrow) and the bleu cheese coleslaw. She ate all of it and loved it! 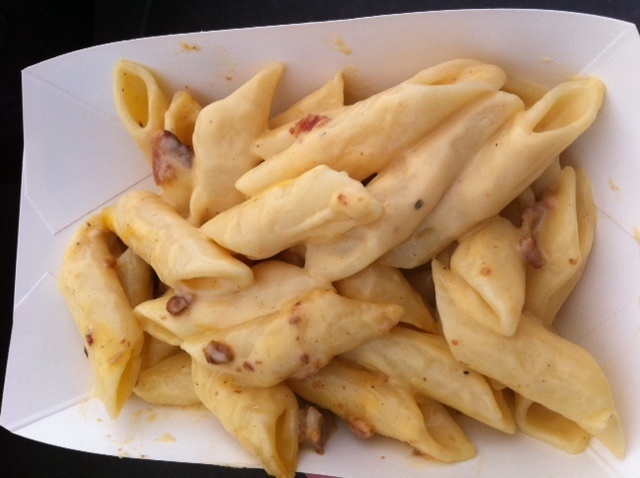 I think I could live off of mac n cheese, it’s one of my favorite things, and Ben’s mac n cheese with smoked bacon is AMAZING! Bacon is also one of my fav things so the combo of the two was great. I was pretty stuffed from my sandwich so my dad and I shared the mac n cheese. 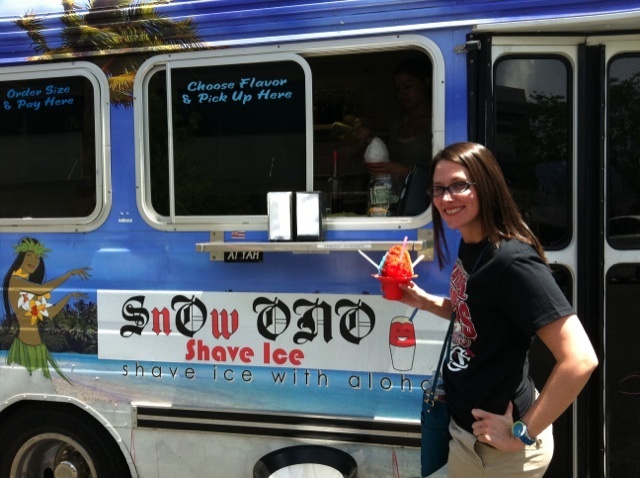 After that filling meal, we had to try to dessert and Sno Ono Shave Ice just happened to be parked nearby as well. 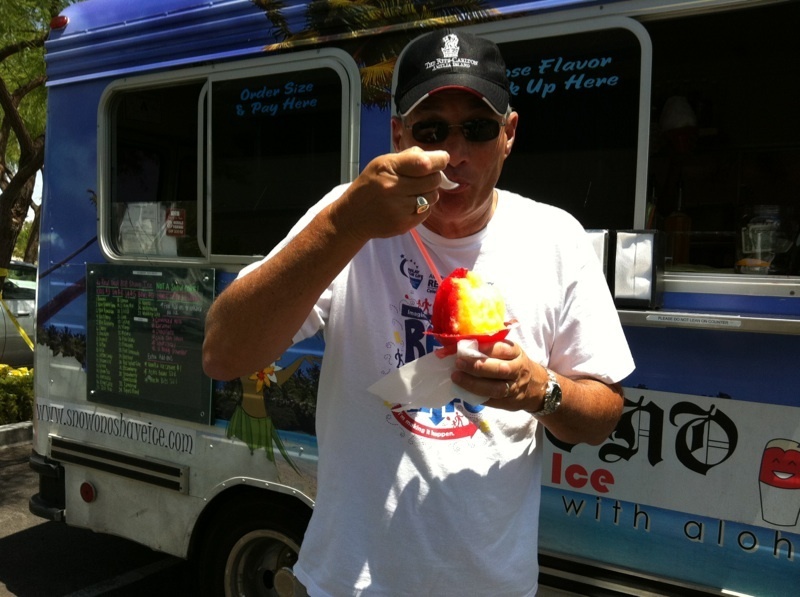 Always up for some shave ice! My dad really enjoyed his! And while not pictured, my mom thoroughly enjoyed hers as well! My parents really loved their first food truck experience! Please check out Ben’s BBQ if you see them around town! The owners are the nicest people and their food is AMAZING! You can check out their website, twitter and facebook for more info and where they’ll be! Also if you’re going to be in Vegas tomorrow night, you should check out the Saturday Night Truck Stop, 5 food trucks in one place from 10 pm – 4 am! It’s at Tommy Rockers off of Flamingo across from the Rio.